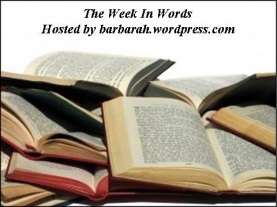 Every week Barbara hosts This Week in Words over at Stray Thoughts. This is a meme which allows people to share quotes from things that they've read - in books, online, in magazines, devotions, etc., etc. As I mentioned last week, I don't normally participate because I tend to put quotes from the books I'm reading in my reviews but since I started running, I've also done the unthinkable (to me) and started listening to words while I run. In audio book form. Which is crazy insane and I vow never to do it off the treadmill because I don't want to start any bad habits, removing myself from handling the written word in actual book form. 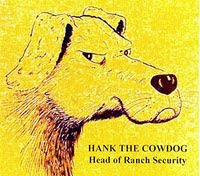 Like last week, I quoted from Hank the Cowdog , the original story. A good number of you have been familiar with Hank and I was glad to see that, oh yes I was. He's a good cowdog to know, being charming, witty and generally amusing and stuff and everything. I highly recommend him to anyone over the age of 8 and under the age of 108. Which is to say, he's a good book companion for just about any age. Here were some quotes the tickled my funny bone this past week . . .
"I'm not one to gush or be overwhelmed. Let's get that straight right here. My years in the security business have trained me to look upon most things as mere facts, facts to be gathered and studied and analyzed. I mean, I'd seen women before, lot's of 'em, scads of 'em. I'd been through times in my life when women were hanging all over me, and I literally couldn't take a step without bumping into an adoring female. And on a completely different note . . .
Bookworm1 turns FIVE today! Be still my mother's heart!!! So today is all about party and play. Not a bad way to spend a Monday, wouldn't you agree? To check out some other words that are being shared today, visit Stray Thoughts. Happy 5th Birthday Bookworm!!! Hope it's a great one! I hadn't read anything of Hank until your quotes, but he does sound amusing. Happy Birthday, Bookworm1! Five is BIG! I can't think of a better way to spend a Monday either! Have fun celebrating five years together. A very cute quote from Hank the Cowdog! And Happy Birthday to your Bookworm. P.S. Good for you for running! My husband is the auditory guy in our family... radio talk shows, Bible CD etc. Like you, I'm not as comfortable listening to the printed word. See, I'm thinking; "It's October, Christmas is almost here!"